Simply put, maybe, but the story of Abbott's realism is not that clear-cut. Her insistence on a "straight" approach to the photographic image, one that minimizes individual expression, has, for instance, come to overshadow most other aspects of her photographic theory and led historians to position her primarily as a proponent of what is now considered a naive understanding of photography's ability to capture an objective world. The instinct or desire to characterize Abbott's approach as purely about objectivity, clarity, and straightforwardness is understandable, though. Indeed, her own rhetoric, her repeated assertion of the photograph's ability to represent the facts of life with a kind of fidelity lacking in all other media, sensibly leads one to this conclusion, as does her oft-cited quotation in which she recalls seeing Eugène Atget's photographs for the first time: "Their impact was immediate and tremendous," she writes; "there was a sudden flash of recognition-the shock of realism unadorned." As mentioned in the introduction, Abbott's emphasis on Atget's realism set her interest in him apart from that of figures such as Man Ray and the surrealists. Where the surrealists were attracted to Atget's work for its weird sense of emptiness and ability to redouble the world as a sign, Abbott was drawn to what she perceived as its pure realist essence. Abbott continued to embrace this type of realist vision in her well-known and influential how-to book on photographic processes, A Guide to Better Photography, which at times reads like an exegesis on the advantages and ultimate correctness of a realist, or straight, approach to the medium. Consider chapter 10's opening words: "Photography is a new vision of life, a profoundly realistic and objective view of the external world.... What the human eye observes casually and incuriously, the eye of the camera (the lens) notes with relentless fidelity." In chapter 15 she declares, "Photography, by its very realistic and factual nature, permits the artist to lie less than many other mediums. To be sure, the photographic processes may be manipulated in ways that seem to deny photography's realistic character. But these diversions do not continue to hold attention." And in chapter 24, which is dedicated to straight photography, she claims: "We can see that straight photography today exercises a corrective influence in two directions, against the kind ... of picture-making extolled by the pictorialists ... and against the frivolousness of those who manipulate the medium purely for selfish ends, as in the surrealist nightmares.... Contrasted with the horrors of sentimentality [pictorialism] and of pseudo-sophistication [surrealism], straight photography is a clean breath of good, fresh air. It ... calls for the use of the medium without perversion of its true character." And when Abbott actually defined straight photography, she emphasized the medium's inherent characteristics. Straight photography, she wrote, is "precision in the rendering and definition of detail and materials, surfaces and textures; instantaneity of observation; acute and faithful presentation of what has actually existed in the external world at a particular time and place." In other words, the straight, objective, or realist photograph is the image revealed without trickery, deceit, or distortion, all in the name of a truthful and faithful presentation of fact. One way that Abbott justified her privileging of straight photography over other methods was to turn to the medium's communicative potential. "The something done by photography is communication," she declared. "It was fashionable a dozen years ago to sneer at communication as the purpose of art and, indeed, even deny that art had a purpose. Non-intelligibility, non-communication were raised to ultimate ends. To say anything in a book, a picture, a piece of music, was anathema. The artist who did so was a prig and a prude and distinctly passé. That phase is past." In an even stronger pronouncement of photography's potential to function as a kind of ultimate utopian ideal of communication-unbounded, free, and clear-Abbott wrote, "The potentiality of the camera for communication of content is almost unlimited. The photograph, full of detail and objective, visual fact, speaks to all people. Where language barriers impeded the flow of spoken or written idea, the photograph is not handicapped; the eye knows no nation." These kinds of quotations abound in Abbott's writing, and I could easily continue with more, but the idea is clear enough: it is only the straight photographic image, through the realistic and objective revelation of its subject matter (or content), that speaks to spectators, both current and future. Today the challenge to photographers is great because we are living in a momentous period. History is pushing us to the brink of a realistic age as never before. I believe there is no more creative medium than photography to recreate the living world of our time. Photography accepts the challenge because it is at home and in its element: namely, realism-real life-the now. What we need is a return ... to the great tradition of realism. Since ultimately the photograph is a statement, a document of the now, a greater responsibility is put on us [photographers]. Today we are confronted with reality on the vastest scale mankind has known. So photography is objective, useful as a tool for communication, and socially and historically oriented. Given this framing of the medium, Abbott's self-identification as "the least arty photographer" in the United States is easy to understand. And for the historian faced with these sorts of declarations, the positioning of Abbott as a photographer preoccupied with demonstrating and asserting the medium's potential for objective representation-the proponent, that is, of a straightforward understanding of photography's ability to capture an objective world-is also easy to understand. And yet. Despite the evidence, I believe it would be a mistake to interpret Abbott's statements as a simple endorsement of objective photography and an outright rejection of all else. The complexity of Abbott's attitude toward the photographic image comes out in her pictures, but her understanding of photography's capacity to function beyond a narrowly conceived idea of representation is also evident in her writing. If we are willing, for a moment, to suspend our judgment about Abbott's sometimes facile account of what constitutes the real with regard to photographic imagery and take a second, closer look at her texts, a more complex analysis emerges. For example, in a speech delivered at the Aspen Institute, on which the preceding extract is based, Abbott explicitly connected photography to democracy and populism, identified photography as the "great democratic medium," and proclaimed, "Photography is made by the many and for the many." This is an interesting claim (and not a simple one) for an artistic medium: a medium that, like the American Constitution, is by the people, for the people. It implies a belief that the users (and viewers) of photography would emerge as a new community, as a people who, not bound by past rules of making or spectatorship, would establish new conditions for making historical subject matter visible and, in so doing, would expose new possibilities for action. Or similarly, returning to the longer excerpt I quoted from her 1951 text, "Photography at the Crossroads," Abbott wrote, "History is pushing us to the brink of a realistic age as never before. I believe there is no more creative medium than photography to recreate the living world of our time." This could be read as a frank statement about the effect of objective representation on people's actions: visually confronted by realistic images of momentous historical events (war, hunger-suffering in general), people will be motivated to act or work toward change. But the same statement could be interpreted with more subtlety: might it not also indicate an interest in studying the present (the "now") as a historical problem? And reveal a desire to recast history as a dilemma of representation? History itself seen through the prism of realism, as a problem of realism? The camera's eye is [not] easily imposed on. It demands logical and reasonable reality in what it records. It creates a marvelous record of fact, of truth, an almost microscopic chronicle of things, but according to its own character, a character mercilessly controlled by optics. What the lens sees is a single image at the instant the shutter is clicked. Unlike the human eye, the lens does not merge or superimpose images from what it saw a moment before or what it may see a moment after. It does not color the image it records with remembered images of other times and places. Nor does it include in its sharp, restricted, instantaneous view what is seen vaguely and indistinctly from the corner of the human eye. The lens freezes time and space in what may be an optical slavery or, contrarily, the crystallization of meaning. The limits of the lens' vision are esthetically often a virtue. However the limits create problems. The problems caused by the lens's ability to freeze time and space is the problem of the solitary image conceived as a finality. To Abbott, such an image, a solitary image, cannot reveal the real, because too much has been left out. Attached to it, there must always be another image or another voice (the trestle bridge and the stone masonry). To limit, then, Abbott's position on the straight, realist, or objective photograph to an idea purely about graphic inscription would be to fail to recognize that her pictures do not simply assert a closed and finished content that some unknown spectator, then and now, must accept without question. Her approach was neither this narrowly conceived nor solely related to depicted subject matter. Such limited understanding of the photographic medium-straight, unmanipulated evidence of what "was there"-reveals a worldview that seeks the conquest of the world as a picture, a view that has no real connection to Abbott's work (or theoretical writing). Yet her approach has sometimes been conflated with this perspective. This type of analysis fails to see that Abbott's idea of realism ultimately depends not on a utopian conception of universal communication (this, despite Abbott's own occasionally utopian rhetoric) but on the construction of a space of communicative interaction. A space-between the photographic print, the photographer, and the spectator-of engagement that is open-ended and that reveals the social contexts out of which photographs come into sight in the first place. "'Documentary' photography is realistic, objective-the more realistic the better-as opposed to the pictorial exploitation of visual subject matter. It seeks to reach the roots, to get under the very skin of reality. Because of its emphasis on realism[,] ... photography must aim at the education of the public to an understanding of its civic responsibilities," declared Abbott in a lecture delivered at the Biltmore Hotel to the Institute of Women's Professional Relations in 1940, titled "Civic Documentary History." The idea that photography seeks to get under the skin of reality is at the same time both enormously appealing and slightly odd. On the one hand, who could resist wanting to get, through the use of photography or by any other means, to the bottom of things, to reach a deeper, truer understanding of the processes that shape our lives? But on the other, how could this possibly be photography's job? How could a medium that records transitory moments achieve such an ambitious goal? To make a series of pictures documenting the construction of Rockefeller Center, a series she created almost a decade before making this claim on behalf of photography, Abbott seems to have tried to get under reality's skin and reach it roots. In one of these efforts (see Figure 3), she photographed the side of what must have been part of the enormous excavation pit formed to establish the new building's foundation. Long icicles line the sides of the exposed rock (and Abbott often spoke of how cold it was when she took these images), mirroring the striations left by the construction equipment's claws and confusing natural processes with human intervention. The rock's gigantic facade fills more than half the picture's frame and confronts the viewer head-on. There is something ugly about this picture: the excavation shows us the building's anchor-the roots, or foundation, out of which it will emerge-but it is messy, almost wild. The picture clearly asserts a here-ness-it is on this exact spot, right at this point, here, in New York City in 1932, that Rockefeller Center is being built-but there is also something rough about the image that causes the site to seem raw and uncertain. The image is devoid of life (where are the people who will occupy and enjoy this space?). It is not that the image appears ghostly, or not this exactly. Rather, the unbuilt building seems to hover between times: the structure's growth, its health, and the very vitality and feasibility of this place as a human space are yet to be determined-the building's function is yet to be enacted. So perhaps these are the roots, the underneath of reality's skin, to which Abbott referred in her 1940 speech. But what of the second part of the statement: how might such a photograph, or any photograph, educate the public? Moreover, following Abbott, what would it mean for photographic production to fulfill its educational mission by engendering civic responsibility? In answering these questions, Abbott again led her audience to an idea about realism: it is, she told her listeners, photography's realist character that obligates the photographic medium to fulfill a pedagogical mission. And, as in the quotation cited earlier from her how-to book about photography's problems-about the medium's inability to superimpose images or remember moments seen just before or after the shutter's click or out of the corner of one's eye-here she also acknowledged, if only implicitly, the need to think of realism beyond the single photograph's frame. Realism refers not to lifelike representation (or not necessarily to this) but to critical engagement with the social world. Through its pedagogical function, the photographic image encourages its viewers to look not simply at the image presented to them on the printed page but to imagine, reconstruct, or rethink the situation that created the conditions for whatever image passes before their gaze. To help photography reach the roots of reality and fulfill its pedagogical mission, Abbott formulated a model of photography that extends beyond what is printed on the page. In short, she reconceived the term realism (and documentary) as an activating strategy and as something generated, not a truth to be displayed that is always already "there," independent of the artist, and passively recapitulated. In a similar vein, Ariella Azoulay has described photography as silent by nature: it is "lacking a mouth, speechless, dumb at birth.... Photos are always dangling between modes-between what is depicted on the photographic paper and the traces of the photographic act, between the two-dimensional image and the chaos of reality out of which it was forged, between being a silent picture on the wall and being (the traces of) a scrap of the world teeming with life." Abbott's emphasis on photography's pedagogical purpose and civic responsibilities redirects her audience to this other space, away from the wall's silence and back out into the world's chaos. In another image from her Rockefeller Center series, Abbott shows Rockefeller Center in a lifeless, not yet inhabited-not yet even fully constructed-state, the very emptiness of which initiates a process of observation and interpretation that challenges the viewer to ask questions: why is this scene empty, who belongs at this scene, whose labor makes this possible, for whom is this space being built? Abbott seeks, in other words, to create images that shuttle the spectator from a space of observation back into an uncertain world, back into the chaos described by Azoulay, that demands engagement, thought, and negotiation. An image like Abbott's of Rockefeller Center seems, in fact, to acknowledge that it is only one single component of a larger historical process that cannot be produced on the surface of the photographic print alone. Only the spectator looking at the photograph, situated in real space, in civic space, and not the photograph at all, has access to a broader understanding of history and event. And according to Abbott, with such access comes responsibility. Civic, as Abbott defined it in her Biltmore Hotel address, refers to a "human being in relation to his social environment," a person who "as a citizen has a responsibility for this environment, its status quo and the possibilities of its improvement in the future." The more Abbott emphasized that realism was a result of the relationship between photography and public responsibility, the more she moved away from the idea of the immanence of truth within the image and toward believing that pictures could be designed to empower spectators to extract from the represented a sense of civic duty. To properly grasp Abbott's position, one must reject the false opposition between looking and acting, and recognize that the interpretation of the world (looking) is a necessary, if insufficient, precondition for transforming it. Once Abbott's realism is understood within this frame, her commitment to a publicly oriented aesthetics of communication also makes more sense and emerges as an idea more complex than some of her simple declarations asserting photography's universal legibility might lead one to believe (recall: "Where language barriers impeded the flow of spoken or written idea, the photograph is not handicapped; the eye knows no nation"). In fact, as a way to understand Abbott's photographic theory more broadly, it is worth lingering for a moment on the idea of communication, because it helps to explain and see Abbott's realism as an aesthetics of the democratic public sphere-a realism imagined as communicative action. Key elements of Jürgen Habermas's and Hannah Arendt's philosophies help illustrate what I am calling a "realism of communicative action," as each developed a theoretical framework centered on (political) action in the public sphere. And they both, in their constructions of this public sphere-this space where meaningful action can happen-focused on a particular kind of communication that they identified as uncoerced persuasion and mutual understanding. This refers to the type of exchange that can lead one, not out of force, but voluntarily, to switch positions, change her mind, take a different course of action than originally planned, and so on. It is the type of exchange that occurs in political debate, academic discourse, or scientific research, and for Habermas and Arendt it is a structuring principle of the public sphere. Neither Habermas nor Arendt considered the implications of his or her philosophical innovations for art, yet I think it is precisely such a consideration that sheds light on the meaning behind Abbott's sometimes seemingly quirky and shifting idea of realism. I say this because Habermas's and Arendt's reflections on persuasion as a mode of interaction that allows for the unforced force of a better reason (a good argument made well!) to coordinate social action in the public sphere strikes me as related to how Abbott imagined or at least hoped her photographs and those of others might also function-like the unforced force of a good argument. Two points, one from Habermas and one from Arendt, will help further clarify this idea. First from Habermas: In The Theory of Communicative Action, Habermas draws a distinction between action oriented to mutual understanding and action oriented to success. Everyday communication, people speaking to each other, collaborating, coordinating plans for future activities-these are all examples of action or speech oriented to mutual understanding, and they contrast purely manipulative interactions. Putting aside manipulative interaction for the moment, Habermas claims that mutual understanding occurs when one person plays the role of hearer or recipient and accepts (or contests) a validity claim (e.g., "x is true," or "y is right") made by another person, who plays the role of speaker. This process presupposes that linguistic utterances-specifically propositions-have identical meanings for the speaker and hearer. But it also presupposes that both parties have adopted certain performative commitments: for instance, to make and respond to such sentences sincerely, to avoid coercion, to accede to the better argument, and so on. In this model of communication, Habermas rejects the traditional philosophical account positing a two-sided opposition of the subject (conscious perception) to the object (outside world), in favor of a three-sided relation between speaker, hearer, and proposition. This triadic construction is particularly useful for conceiving a realist aesthetics and photographic practice of communicative action. Just as Habermas posits interaction as a relationship between speaker, hearer, and proposition, photography might also be thought of as generating a three-sided relationship between the photographer, the spectator, and the photographed. In this configuration, the photographic print functions as the mediating structure through which this three-sided communication occurs. As a consequence, the image does not (cannot) exist as a closed-off representation of some distant past whose meaning is solidified and determined, but rather can only be understood as an open-ended proposition whose meaning is jointly determined and constantly redetermined. The photographer's role here is significant not just because she decides what and how to photograph but also because she is a presence-even if an elusive one-whose choices the spectator is obliged to reconstruct or try to understand. The key idea from Arendt that helps explain Abbott's realism is the concept of action. In Arendt's central work, The Human Condition, she distinguishes three elements of the vita activa, or active life: labor, work, and action. By labor, Arendt means the activities necessary to biologically maintain and reproduce humanity, including the background condition of the natural world. These activities, represented by an ever-recurring circle, encompass the dull compulsion of the necessary. By contrast, work, represented by an arrow ending at a point, encompasses the creation of artifacts, which for Arendt included the construction of artworks. Neither labor nor work provides for an unmediated interaction between humans; instead, in each sphere, interactions between humans are mediated either by nature and necessity (labor) or by artifacts (work). Only in the final sphere-that of action-can humans engage one or other without these mediations, and only the sphere of action corresponds to "the human condition of plurality, to the fact that men, and not Man, live on the earth and inhabit the world." Action, for Arendt, is where politics happens: the founding of a polity; the participation in guiding its affairs; debate; and persuasion. Above all, these activities are intrinsically public: they require an understanding of the individual not as a thing but as a distinct, unique human being capable of speech, understanding, and persuasion. Also, importantly, action, or what could be called the political life of the community, is open-ended: there is no unchanging cycle of events that action sets into motion, nor any fixed point at which action ends. Due to the fact that action operates in an intrinsically plural setting, where the reactions of others cannot ever be perfectly predicted, it is unpredictable: there is always multiplicity. Arendt's definition of action helps construct and explain Abbott's realism, in that it provides a model for how Abbott wanted her photographs to behave in the world, as socially committed persuasive action. As the least arty photographer, she positioned her images as objective, communicative, and socially and historically committed. Yet these conditions were not meant as descriptions of content, nor were they presented as demands being made upon representation per se. Rather, Abbott's insistence on objectivity, communication, and the image's social significance emerged out of her desire to locate images in a civil society or public sphere. And she imagined her photographs, once they were embedded in a public sphere, as propositions that necessitate response, though what that response is, cannot be known. This is the unpredictable space of action, for while the spectator's gaze at and interaction with an image might ignite further interaction-between, for instance, that spectator and other members of the polity-at the outset it is impossible to foresee how reactions and interpretations will play out. This photograph behaves as a request, as an appeal to act. To act not necessarily on behalf of the family-though this is part of it, since at such a far remove it feels as if the pictured have been unjustly restricted from the space of action-but more generally, out of a sense of responsibility and citizenship. Abbott hoped that, after looking at this picture, responsible spectators would carry this image-and their interpretation of it, of the clothes hanging behind the family, of the gravel they stand on, of the simply constructed building (their home?) behind them-into the public realm and, as a result of this process, come to understand what she saw as an obligation to act. This is realism's civic responsibility. The image was taken while Abbott traveled with the art critic Elizabeth McCausland in 1935 through the upper South and Midwest. The two women hoped that, after their trip, they could use images like this one in conjunction with captions written by McCausland to produce a photo-book portrait of the nation. The book itself, they dreamed, would be a "great democratic book," in terms of both its reach and its message. If we think of Miner Family, Greenview, West Virginia as part of such a project, the photograph's relationship to Arendt's action becomes even clearer, in that the book itself was designed as an activating device. Abbott and McCausland imagined this book as a tool that would represent America to Americans and, in so doing, inspire citizens to participate in a rejuvenated public sphere. Some might say that the gesture of taking up a camera and pointing the lens toward someone or something may be described as the moment when photography begins and a photograph is produced, while the print or computerized image may be perceived as the moment of completion of this work. But those who have engaged with photography know very well that this moment of the photographic act, which is said to reach its end when incarnated in a final product, a print or digital file, is in fact a new beginning that lacks any predictable end. Azoulay goes on to say that this quality of an unpredictable end is Arendt's exact definition of action, and adds, "Even when a spectator merely glances at a photograph without paying special attention to what appears in it, the photo rarely appears as a mere object. The photo acts, thus making others act." Azoulay identifies another quality that she relates to Arendt's account of action: the photograph's indexical status-its physical or literal connection to something that happened in the world, its function as a trace of some event that once was. To Arendt, action is indeterminate and oriented to the future-we cannot know how one person will respond to the actions of another-but it is also irreversible. Once a deed is done, it is done. Azoulay points out that photography is similarly "bound to this description: The image inscribed within [the photographic print] cannot be undone." The photograph records what was once there, in front of the camera, and as with an action it too cannot be undone or erased. Yet if we focus on the irreversibility of this action, "what is revealed," Azoulay writes, "is the fact that the entanglement of actions in others' actions constantly pulls the initial actions away from what might be perceived as irreversible results." While the image exposed on a piece of photographic paper may appear to be the final moment, the completion, of the photographic act, it might conversely be understood as one énoncé in a chain of articulations that can take many, even contradictory, paths. However, there is another way in which the photograph's indexical status, its ineliminable link to a material past independent of both photographer and viewer, is important for thinking about or framing Abbott's realism in terms of communicative action. The photograph's ability to make a seemingly definitive statement about something that happened in the visual field might also be thought of as generating performative presuppositions similar to those necessarily adopted by participants in discourse. Even if only counterfactually-even if what we see in a photograph is not true (and even if we know what we see in a photograph is not true)-photographic images present themselves as a record of what-has-been; they function as statements. And, as statements, photographs demand a corresponding acknowledgment from the viewer (that she understands the photograph as an index of the world) and a reciprocal responsibility from the photographer (for generating that understanding on the part of the viewer). Or as Abbott said, "What we need is a return, on a mounting spiral of historic understanding, of the great tradition of realism. Since ultimately the photograph is a statement, a document of the now, a greater responsibility is put on us." This is not to say that photographers cannot or do not manipulate negatives and images to suit their purposes, or that spectators cannot refuse to believe what photographs present. But analogous to the pragmatic presuppositions of linguistic communication-like the identity of sentence meanings-the creation and comprehension of the photograph requires photographer and viewer to performatively adopt the presupposition that the photographed once was. And for Abbott, this aspect of photographic practice-the thinking of images as statements similar to speech acts-carried with it a normative or moral content: she believed that a realist photograph implicitly demanded that the spectator act in response to its announcement. To be sure, whatever the tradition, there will always be those whose splendid rhetoric rings out, as through an amplifier, who yet say nothing-as in the famous nonsense speech with which Chaplin's Modern Times opens. Among the many subjects chosen for exploitation by these photographic rhetoricians [has] been the fad for "pictorialism," like the old-time photographers who spend all their energies imitating painters.... Thus in photography, as in any other language, the "words" which can be used to say something important and immediate can also be distorted and robbed of meaning. This passage illuminates Abbott's realist approach in part by demonstrating her own equation of individual images with words and, in this case, of pictorialist images with manipulative purposes. Abbott's hostile reaction to pictorialism, as she condemns it for the way it distorted and robbed meaning from photographs, resonates with Habermas's argument that the performative presuppositions that make everyday communication possible have a normative content: they commit both speaker and hearer to act on, and only on, the unforced force of a better reason. In her speech "Civic Documentary History," Abbott presented a clear alternative to this kind of manipulated or distorted meaning: after describing her photographic practice, she went on to explain the various ways that New Yorkers might take action in response to what her images revealed. Citizens might work, she stated, toward "civic betterment, city planning, slum clearance, public housing, park development, playground expansion, highway and traffic control[,] ... water front beautification, [and the improvement of] essential services (markets, water supply, rapid transit as the ferries, 'els,' buses, etc.)." Despite Abbott's specific examples of potential actions, however, there is an open-endedness to this model of photography that situates the photographic print as a statement or performative presupposition. Thought of as persuasive speech, the image demands a response-though, again, what that response will be is uncontrollable and unpredictable. This is an important idea because it constitutes part of what makes Abbott's realism plural. On one level, the realisms of Berenice Abbott are her simultaneous interest in a straight, or objective, approach to the image and in the medium's orientation to communicative interaction with an audience. Within this first level of plurality, however, there exists another: the plurality of responses generated by that communicative interaction or photographic énoncé. One element present in both photographs but not yet mentioned is the large sculptural form that fills the entire right-hand side of both images. In the first version, this enormous gray statue (it is of George Washington) blends into the scene, and where the folds of Washington's gown align with the pillars on the building's facade, there is an easy flow from one object to the next. There is a humorous play of scale between Washington's boot and the few lonely pedestrians on the street, and no real tension, no antagonism, exists between the image's disparate components. The statue plays a much different role in the second image. Here it stands completely in shadow; in fact, the only thing that allows its dark, shadowy silhouette to be read as that of a statue at all is Washington's boot, which emerges from under the sculpture's black mass like a giant's foot, ready at any moment-should the giant so choose-to step out onto the street regardless of anything or anyone in its way. As the viewer looks from one thing to the next, the photograph does not flow-it is not a space of uniform action, but rather the opposite. It stages a scene designed around tension and fragmentation. The contrast between light and dark, and between Washington's enormity and the pedestrians' anonymous smallness, restores to this image a plurality missing in the first version-missing both internally, in terms of what is actually represented within the scene, and outwardly, in terms of how the photograph functions as a statement to which a spectator must respond. It is not that the statue of Washington can act; obviously it cannot. But it appears in the second version of Stock Exchange as a present absence, an antagonistic force that creates a gap between the pedestrians roaming the street and the social and economic processes that drive society. In this gap, uniformity is dissolved and the conditions of plurality are reestablished. In correspondence dating from the summer of 1944, Beaumont Newhall, the first curator of photography at the Museum of Modern Art, and the art critic Elizabeth McCausland debated the uses and future of photography. At the time-this was during World War II-Newhall was in Italy completing service in the army air force, and McCausland was in New York writing criticism, completing research on a book about how economics had affected the history of art, and advocating for progressive and antifascist causes. Their conversation about photography's future began when McCausland, curious if military service had affected her friend's perspective on photography, and on art in general, noted in a letter dated August 7, 1944: "I'd like to know how the experience of the war has oriented your thinking about esthetics, the function of art[,] ... and all such related questions." Now documentary photography most emphatically does not mean all the ugliest spots in town. It means reality. If reality is peace and beauty, documentary photography means peace and beauty. But, if reality is war, slums, starvation, then documentary photography means war, slums, starvation.... Facing the truth[,] we summon up forces to change the facts and make them consonant with the dignity of human life. Refusing to face the truth, we become responsible for the ugly facts and perpetuate them in a dangerous focus of infection.... For we must believe that the truth, properly stated and understood, will prevail. But Newhall's response must also have come as a surprise to McCausland because her own views had developed in dialogue with Newhall's earlier efforts to define documentary, as in his important article "Documentary Approach to Photography." They had grown up together intellectually, and yet now, there they were, separated by a seemingly unbridgeable geographic and intellectual divide. From McCausland's perspective, Newhall's position was untenable. It was simply not possible to construct such a thing as a "negative" or "depressing" documentary photograph; the formulation made no sense. As McCausland explained to Newhall in her response to his letter, photographs even of the harsh circumstances of economic depression or world war can only be, in their very communicative structure, "very beautiful in abstract terms, if one has a right to think in such a way about life and death." Many years after McCausland wrote these words to Newhall, Abbott echoed the thought in a short article about her science work. The more clearly a photographer expresses the truth of his or her vision, she explained, "sometimes in its most unaesthetic facet or most attractive homeliness, the better he [sic] succeeds in his mission and the nearer he approaches the goal of communication, and perhaps, art." The Realisms of Berenice Abbott provides the first in-depth consideration of the work of photographer Berenice Abbott. Though best known for her 1930s documentary images of New York City, this book examines a broad range of Abbott’s work—including portraits from the 1920s, little known and uncompleted projects from the 1930s, and experimental science photography from the 1950s. It argues that Abbott consistently relied on realism as the theoretical armature for her work, even as her understanding of that term changed over time and in relation to specific historical circumstances. But as Weissman demonstrates, Abbott’s unflinching commitment to “realist” aesthetics led her to develop a critical theory of documentary that recognizes the complexity of representation without excluding or obscuring a connection between art and engagement in the political public sphere. 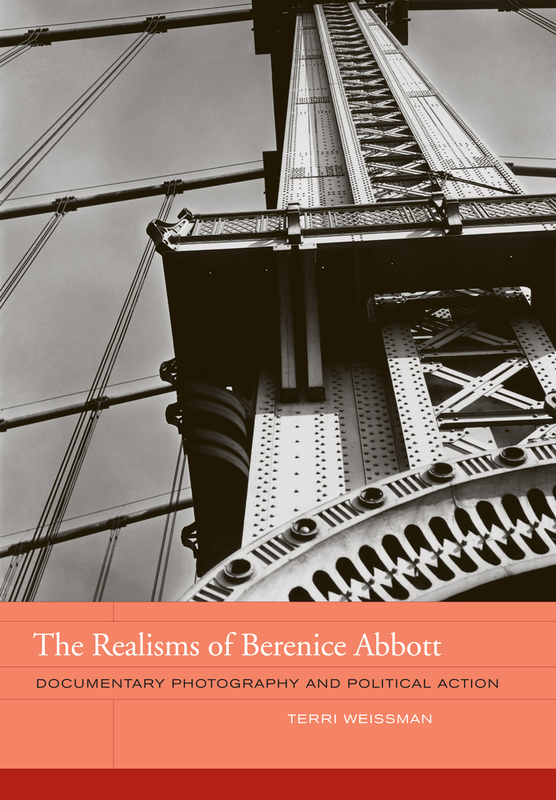 In telling Abbott’s story, The Realisms of Berenice Abbott reveals insights into the politics and social context of documentary production and presents a thoughtful analysis of why documentary remains a compelling artistic strategy today. Terri Weissman is Assistant Professor of Art History at the University of Illinois, Urbana-Champaign and is a contributing editor to American Modern: Documentary Photography by Abbott, Evans, and Bourke-White (UC Press).